The latest addition to the Perfect Pieces PenDelfin For Sale section is this super, early and retired PenDelfin rabbit Shiner – just in time for Christmas! The PenDelfin Shiner rabbit is an early PenDelfin rabbit only produced in the 1960’s. This example of Shiner is wearing lovely red trousers. Click here to see more information and pictures of Shiner. We have a wide range of PenDelfin rabbits to buy including many early and rare models as well as PenDelfin display stands and PenDelfin Family Circle rabbits. Click here to view our full catalogue of PenDelfin for sale. This entry was posted in New Stock and tagged Christmas Gifts, Jean Walmsley Heap, PenDelfin rabbits, PenDelfin Shiner, Retired PenDelfin on November 25, 2014 by Perfect Pieces. We have recently added an unusual blue PenDelfin Rosa rabbit to our PenDelfin rabbits for sale section. This version of the PenDelfin Rosa wearing a blue skirt was only made by PenDelfin for around two years from 1982 until 1984 and so is much more unusual than other colours of Rosa that were produced by the PenDelfin Studios from 1982-1998. To view further details of this lovely and unusual PenDelfin rabbit – click here. We have a wide selection of PenDelfin for sale, so if you’re starting to think about Christmas and want to find that perfect gift for a PenDelfin collector be sure to check our our full selection of PenDelfin for sale – click here. This entry was posted in New Stock and tagged Christmas Gifts, Jean Walmsley Heap, PenDelfin rabbits, PenDelfin Rosa on November 7, 2014 by Perfect Pieces. A recent addition to our Perfect Pieces PenDelfin stands section is this great PenDelfin Milk Jug stand designed by Jean Walmsley Heap. 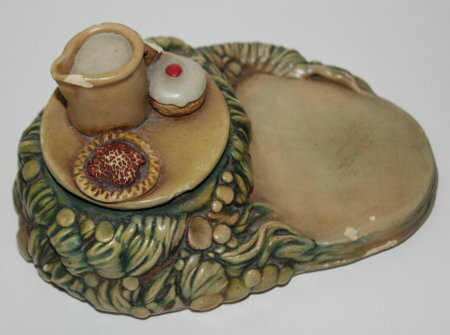 This PenDelfin stand was only made by the PenDelfin Studios from c1966 until 1973 and features a little tree stump with a plate with milk jug and bun cake on! It has a space for a PenDelfin rabbit to stand, the PenDelfin Muncher rabbit would be perfect! We stock a wide variety of old and retired PenDelfin rabbits to buy including some very early and desirable pieces. If you’re looking for an unusual Christmas present for a PenDelfin collector then be sure to check out our current selection of PenDelfin for sale – click here. This entry was posted in New Stock and tagged Jean Walmsley Heap, PenDelfin Milk Jug Stand, PenDelfin rabbits, PenDelfin Stand on November 6, 2014 by Perfect Pieces. A recent addition to our Perfect Pieces PenDelfin Rabbit For Sale section is this lovely and very desirable fully pleated skirt version of the PenDelfin Margot rabbit. This is the very early and rare version of the Margot rabbit with the fully pleated skirt, which was only made by the PenDelfin Studios from c1956-1957. 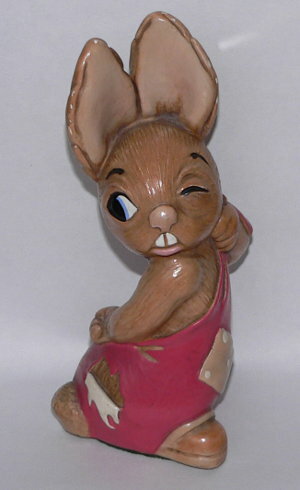 Click here to see more picture and full details of this rare PenDelfin rabbit. We have a wide range of collectable PenDelfin rabbits for sale. Beat the rush and don’t leave your Christmas shopping too late! This entry was posted in New Stock and tagged Christmas presents, Jean Walmsley Heap, PenDelfin Margot, PenDelfin rabbits, Retired PenDelfin on October 21, 2014 by Perfect Pieces. If you’re looking to buy a Christmas present for a PenDelfin collector then why not consider a PenDelfin display stand? These can be brilliant for adding variety and a real-life feeling to a PenDelfin collection. Betsy Barge is a great fun boat shaped stand, quite unusual and perfect for around the PenDelfin Jetty and PenDelfin Shrimp Stand. This PenDelfin stand is also retired from production and allows your PenDelfin rabbits to sit inside a boat! If you’d like to view our full selection of PenDelfin stand for sale – please click here. This entry was posted in Gift Ideas and tagged Christmas Gifts, Christmas Shopping, PenDelfin Bandstand, PenDelfin Betsy Barge, PenDelfin rabbits, PenDelfin Stands, PenDelfin Toy shop, PenDelphin, Retired PenDelfin on November 27, 2013 by Perfect Pieces. Perfect Pieces November Newsletter – Out Now With Christmas Posting Dates & Gift Ideas! The November 2013 Perfect Pieces newsletter is now out. In this run up to Christmas issue we take a look at a few of the new pieces of stock we’ve added this last month in preparation for all that Christmas shopping! We also include full details of our last posting dates for Christmas 2014. CLICK HERE – To read our run up to Christmas 2014 Newsletter! If you go out and about and visit Antique & Collectors fairs then do get in touch and give us your feedback on any you’ve visited. We’re always keen to hear what different antique fairs are like and always welcome feedback so we can publish your thoughts and suggestions of Antique Fairs worth visiting in future newsletters! This entry was posted in Newsletter and tagged Antique Fairs, Christmas Gifts, Christmas Shopping, Last posting dates, PenDelfin, PenDelfin rabbits, Poole Pottery, Troika on November 22, 2013 by Perfect Pieces. Within the PenDelfin section on PerfectPieces.co.uk we have a wide range of musical PenDelfin rabbits for sale including a lovely early pink PenDelfin Margot rabbit with very early PenDelfin gold rectangular PenDelfin label to her base. The PenDelfin Margot was originally designed by PenDelfin founder Jean Walmsley Heap and is an early PenDelfin rabbit who would have been around when the first version of the PenDelfin Bandstand was produced. 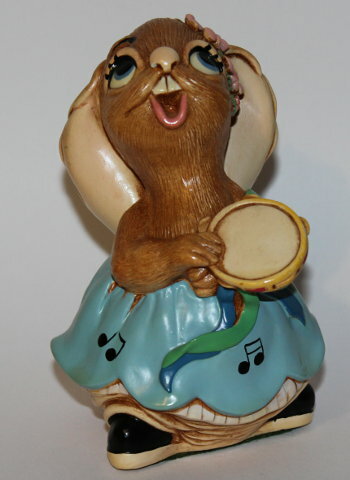 Other musical PenDelfin rabbits for sale include a lovely PenDelfin Maud, the amusing PenDelfin Busker rabbit, the early PenDelfin Phumf rabbit designed by Doreen Noel Roberts and the adorable singer, PenDelfin Solo! If you’re looking to buy PenDelfin rabbits then do keep checking back as our stock is always changing. If we can be of any help then do please get in touch. This entry was posted in PenDelfin and tagged Doreen Noel Roberts, Jean Walmsley Heap, PenDelfin Margot, PenDelfin Maud, PenDelfin Phumf, PenDelfin rabbits, PenDelfin Rosa, PenDelfin Solo, Retired PenDelfin rabbits on September 24, 2013 by Perfect Pieces. Perfect Pieces September Newsletter…Out Now! The latest Perfect Pieces newsletter is now out! In this month’s issue we detail some of the antique fairs that are happening in September 2013 and also take a look at a few of the interesting retired and collectable PenDelfin rabbits that we have added to the Perfect Pieces PenDelfin rabbit section this last month. If you’ve visited any antique fairs and think they’re worth visiting again then do get in touch – we’re always really interested to read reviews of other antique fairs we’ve not visited. 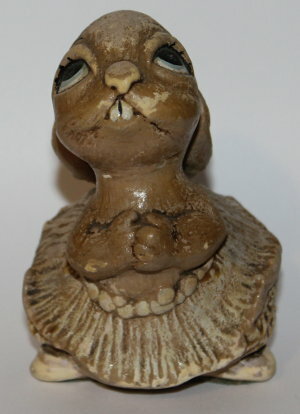 This entry was posted in Newsletter and tagged Antique Fairs, Buy PenDelfin, Buying Pottery, PenDelfin, PenDelfin for sale, PenDelfin rabbits, PenDelphin, Retired PenDelfin on September 6, 2013 by Perfect Pieces. Perfect Pieces April Newsletter – Out Now! The April 2013 Perfect Pieces newsletter is now out. In this issue we take a look at a few new pieces of stock including a lovely Troika Spice vase as well as requesting your help in identifying some pottery marks sent in by fellow readers! If you visit Antique & Collectors fairs often then do give us your feedback on them. We’re always interested to hear how Antique fairs are doing and which ones are worth visiting. We’ll then publish your thoughts and suggestions of Antique Fairs worth visiting in future newsletters! This entry was posted in Newsletter and tagged PenDelfin rabbits, Pottery Marks, Troika Pottery on April 10, 2013 by Perfect Pieces.